Durban - Police separated a group of foreign nationals marching to Durban's City Hall on Wednesday from a group of South Africans. As the foreign nationals illegally marched down Dr Pixley KaSeme [West] Street towards the City Hall, police kept a group of South Africans at bay. The South Africans were chanting: "They are dogs who must go home." When the foreign nationals approached Dorothy Nyembe [Gardiner] Street, police used stun grenades to disperse them. Earlier police attempted to disperse the group of over 300 foreign nationals who were marching against xenophobia near Curries Fountain with water cannon and teargas. They were initially due to march before Easter, before police postponed it. 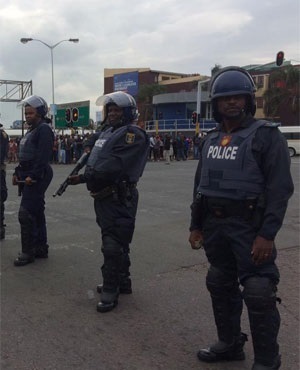 eThekwini metro police spokesperson Superintendent Eugene Msomi said the group had applied for permission to march on Wednesday, and it had been granted. After they had gathered on Wednesday morning, police cancelled the march, citing an imminent threat to the group. KwaZulu-Natal police spokesperson Thulani Zwane confirmed that Chatsworth residents attacked foreign nationals staying in an informal settlement on Tuesday night, forcing them to evacuate.